CLW fuel tanks is also called fuel tank truck,mobile fueling truck,etc, widely used in storage, transporting and refilling for all kinds of oil (gasoline, diesel, crude oil, lubricating oil and coal tar, etc) . Product Notes of CLW Brand fuel tank trucks manufactured by Chengli Special Automobile Co., ltd. as below. If you're interested in our fuel dispensing truck, please send email to szhj9999@163.com or talk to Anita by Whatsapp/Wechat: +86 13329899995.
main technical parameters of FAW brand 4*2 RHD refueler truck manufactured by Chengli Automobile Co., Ltd. as below. The transporting medium is gasoline/ diesel/ oil/ fuel, etc. other Equipment or performances 1. The fuel tanker shape is ellipse, adopts 5mm high quality GB carbon steel, with one compartment and several anti-wave sheets. And the fuel tanker volume is 6,000L-8,000L. 2. Equipped with special carbon steel fuel pump, one manhole, one self-discharging valve at the tanker bottom, one aluminum ally emergency shutoff device, one unit aluminum alloy elevating guardrail; one unit of China-made refueling dispenser and 15m self-return Refueling reel and refueling nozzle, pipeline, ladder, one toolbox, etc. 3, The truck is painted metallic coating. And the fuel dispenser is installed at the rear part like the picture show. Chengli special automobile co.,ltd. 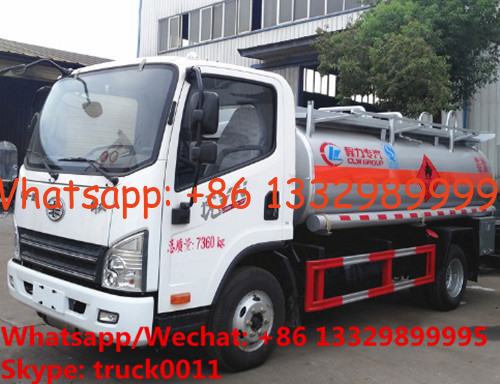 ,which is a famous manufacturer producing all kinds of special trucks.it can offer many kinds of oil tank trucks from 2000 liters to 40000 liters. Such as oil tank truck, fuel tanker truck, heavy oil tank truck, fuel oil tank truck,liquid tanker truck, gallon fuel tank truck,diesel oil tank truck,oil transportation tank truck,fuel tank cap truck, etc. And also support Customized. Chengli Special Automobile Co., Ltd. is the leading manufacturer and supplier of fuel tank in China since 2004s. With many years' development, Chengli Special Automobile Co., Ltd. could supply Dongfeng fuel tank, ISUZU refueler truck, HOWO oil truck, Forland fuel dispenser truck, etc. More information, please feel free to contact with Ms. Anita. The hot sale line is 0086 13886878855.